Priyanka Gandhi, 47, a scion of Indiaâ€™s most prominent political family, formally entered politics on Wednesday, ahead of general elections in May. Rahul Gandhi, her brother and president of Indiaâ€™s main opposition Indian National Congress Party, appointed her to the post of general secretary, according to a party release. The Nehru-Gandhi family has had three prime ministers, including Jawaharlal Nehru, who was Indiaâ€™s first prime minister and great grandfather of Rahul and Priyanka Gandhi, followed by Indira and father Rajiv Gandhi. The Congress party announced two new general secretaries on Wednesday, Priyanka and Jyotiraditya Scindia, who have been given, charge of eastern and western Uttar Pradesh. The populous state sends a large number of lawmakers to parliament and often plays a critical role in deciding who forms government. The Congress party has performed poorly in this state, once a stronghold, winning only two seats in the 2014 general elections. 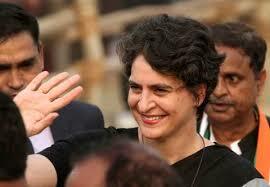 Officials commended Rahulâ€™s appointed of Priyanka to a senior party position. They said that the appointment would energise the campaign to oust Prime Minister Narendra Modi in the national election. Priyanka has campaigned for the Congress party in previous elections to help her brother, but largely stayed in the wings, letting her brother take the mantle of the Nehru-Gandhi dynasty that ruled India for most of its post-independence era. Bearing a striking resemblance to her grandmother and former prime minister Indira , who was known as â€œIndiaâ€™s iron ladyâ€™â€™ Priyanka would be a Congress general secretary for Uttar Pradesh, the most populous state and key to the national poll. â€œWe will play politics on the front foot, I am very happy my sister, who is very capable, will work with me,â€ Rahul told reporters. Congress is trying to build an opposition alliance against Modiâ€™s ruling BJP, which faces grumbling over a lack of jobs and a weak farm economy. Modi remained the frontrunner, but his re-election is no longer assured after the BJP suffered a string of defeats in state elections in December. Priyanka would oversee the eastern part of Uttar Pradesh state, including the city of Varanasi, one of Modiâ€™s political constituencies, the Congress party said in a statement. â€œThis will have an electrifying effect across the country, not just in Uttar Pradesh,â€™â€™ said Jitin Prasada, a Congress party leader. Priyanka is seen as a more natural campaigner and a bigger draw than her brother, who appeared wooden during the last election. More recently, Rahul Gandhi has adopted a combative style, sniping at Modi with accusations over graft, abuse of power and a divisive brand of politics. Priyankaâ€™s entry into full-time politics could give more ammunition to Modi who has positioned himself as the son of an ordinary tea-seller against the dynastic politics of Congress. â€œWe want to congratulate the Congress party on this move. Basically they are saying Rahul has failed, now they need his sister,â€ said BJP spokesman Sambit Patra. The siblingsâ€™ great grandfather, Jawaharlal Nehru, was Indiaâ€™s first prime minister following independence from Britain in 1947. Their grandmother, Indira Gandhi, succeeded him after a brief interval. After she was assassinated by her Sikh bodyguards in 1984, her son, Rajiv Gandhi, took over as premier. Rajiv was killed by an ethic Tamil suicide bomber while campaigning for a general election in 1991. His Italian-born widow, Sonia, initially resisted calls to enter politics before taking the plunge and lifting Congressâ€™ flagging fortunes under her familyâ€™s brand name. Sonia stepped back as her son took the reins of the party. â€œThere is a difference between Congress and the BJP. In the BJP the party is our family, whereas in Congress the family is the party,â€ said the BJPâ€™s Patra.